Private rural self-catering cottage accommodation in the heart of Hautere right here on Te Rauparaha's Coast - 6km from Otaki. Experience a simpler way of life: picnic, swim, fish, tramp in the Tararua foothills and absorb the rich history of the Otaki Gorge. Light, fresh and quirky, the cottage offers a traveller's respite, a romantic interlude, or an opportunity to taste the local produce, oils, breads and wine. The Totara Grove is 10 mins from Waikanae Metro rail head; 25 mins from Paraparaumu Airport and only an hour's drive from Wellington or Palmerston North. Pick ups and drop offs from Otaki i-SITE negotiable. Shop till you drop at Otaki's popular Outlet shopping precinct - Pumpkin Patch, Hunting and Fishing, Icebreaker, Kathmandu, The Merino Outlet; find exquisite treasure at Planet Retro. Lunch at local cafes; visit the Rangiatea Maori Church; take the golf clubs for a swing. Borrow the bikes or walk the riverside trail to the beach where the Felixstowe and City of Auckland were shipwrecked in 1878; search for treasure at heaps of Otaki Geocache.com locations; join a scrumptious cooking class with Ruth Pretty or visit her kitchen shop - whatever your choice, the Totara Grove is a little bit of peace and quiet away from the urban bustle. Set among mature trees on a small farmlet, the cottage has its own private deck and lawn with a brazier and outdoor table, chairs and hammock. Sheep and cattle graze up to the surrounding fences. The paddocks and trees are home to pukeko, ducks, rabbits, kereru, kotare, tui, fantails, and rosellas. The Cottage has a fully self-catering kitchen with oven and fridge, Laundry, with Double Bed and a Single mattress on the Mezzanine. Guests from Canada said: "This place is a little bit of paradise. 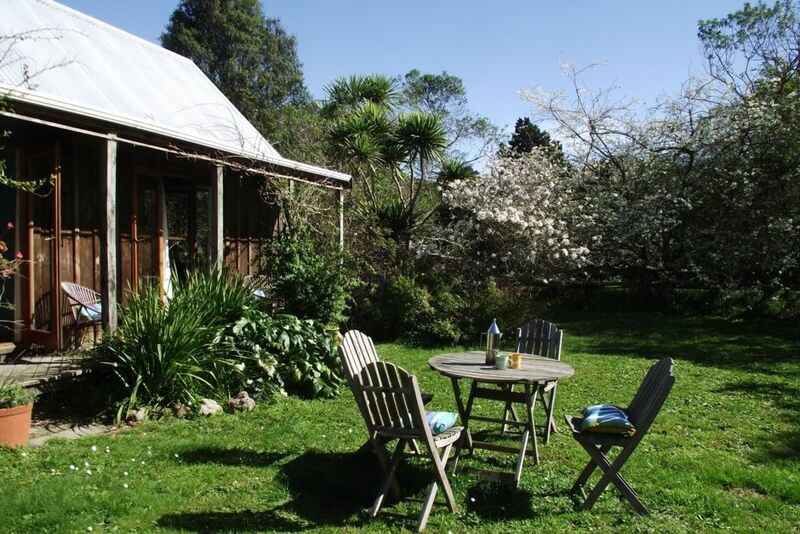 We found Totara Grove to be very quiet, well off the beaten track with great, rustic charm." In consideration of future guests we respectfully request that you do not cook curries, shellfish or other smelly or greasy foods. We reserve the right to charge you for extra cleaning and any loss of income due to the cottage being unoccupied. Any damage/loss caused by you could result in costs of repair (and any insurance excess) being charged. A $10.00 fee applies when you use our port-a-cot. Close access to Otaki Forks and River. Borrow the bikes to explore or take the golf clubs for a swing. The cottage was perfect for our weekend retreat, and we were able to take our dog which was a real bonus. It was in a quiet rural area, but not far from the town, beach and a Department of Conservation walking area. The cottage had all the amenities we needed for self-catering and we were able to relax. Thanks for the lemon muffins on arrival! Robyn and Chris. Thank you to Pip for such a lovely and welcoming stay. The property was ideal for us to get away from the noise and bustle of our everyday life. It had everything we needed and more! A beautiful, tranquil setting in summer and we very much appreciated being able to bring our elderly dog with us. Thanks again! This is such a charming little cottage, surrounded by nature, lots of birdlife. We had a wonderful time staying here. So grateful the owners are pet friendly and allowed us to bring our pooch with us. It was lovely sitting out in the garden at dusk. We'll be back! Thank you! Secluded little cottage that feels far away but is actually close to Otaki township and the great walks at Otaki Forks. Loved this little slice of paradise! Cosy, cute and private property. Cosy, cute and private property. Our two dogs loved it.